Our family has been on a search for new and easy recipes. Ones that taste great and are quick and easy for our busy schedules. Earlier this week we stumbled onto something so simple, yet so delicious that I had to share. It’s got me thinking about all the different ways we could use it. I’m talking about easy shredded chicken you make in the crock pot. It all started when I told my wife I was hungry for barbecue chicken sandwiches. She thought they sounded good too so she picked up some boneless skinless chicken breasts. The next morning before we headed out the door for work and school I put the chicken in the bottom of our crock pot. I sprinkled it with an onion soup mix and poured in 2 cups of water. Thats it! The chicken cooked in the crock pot on low until the kids got home from school. Then they switched it to warm. When I got home I drained the liquid. (In hindsight, I wish I had saved it to freeze. It would have made a great soup base for another meal). Then I used 2 forks to pull apart and shred the chicken right in the crock pot. For supper one of my daughters enjoyed the meat plain. The other one had it on a bun with BBQ sauce. My wife and I used it to make wraps in whole wheat tortillas with cheddar jack cheese, spinach, and BBQ sauce. They were awesome! It’s got me thinking of all the different ways to use the shredded chicken. * Add some cream of chicken soup and veggies. Serve over biscuits or potatoes. * In buffalo wing dip. I’m sure I’ll think of more. 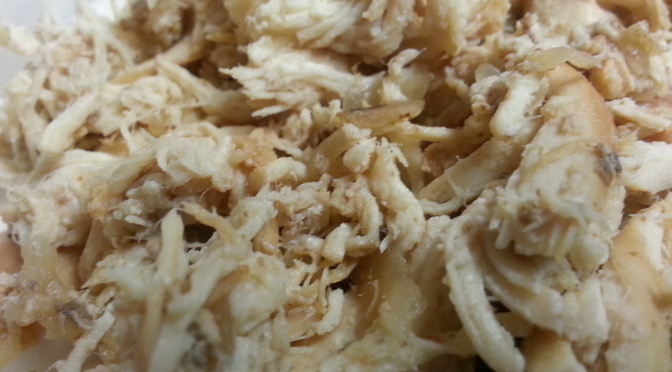 What recipes do you use shredded cooked chicken in? We just throw the individually frozen chicken breasts in the crockpot by themselves. (No water.) Then when they are done, I throw them into my KitchenAid mixer with the paddle attachment and just turn it on for a few seconds and they just shred! Love it! Nice! Thanks for the tip! What are some of the things you use the chicken for?